Oliver Batchelor was born in Goldthwaite, Texas in 1933 and raised in Kermit, Texas where he excelled at an all-state level in football, band and choir. Earning a Bachelor of Science Degree in Geology at Texas Western (now UTEP) in El Paso, Texas, he worked in several jobs and towns until settling in Odessa in 1962 with the opening of the Rexall Chemical Refinery (later known as Huntsman Chemical). Oliver retired in 2002 as a Reliability Engineer for Huntsman with 40 years of service, having earned additional educational degrees along the way, including a Bachelors Degree in Engineering. In addition, he served in the Army Reserves for many years receiving an honorable discharge in 1970 with the rank of Major. Through the years, Oliver's passion for sports and volunteer service has been extraordinary. He worked as a football referee from 1964 to 1976, traveling all around West Texas to work high school games. 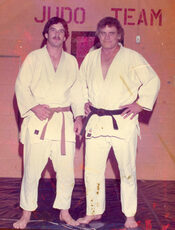 Oliver's association with the Odessa Boys Club began in 1967 when he was first introduced to the sport of judo. Judo was always been a significant place of service and sport in Oliver's life. Oliver is a 6th degree black belt (Rokudan). 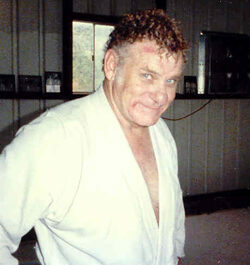 He was promoted to 1st degree black belt (Shodan) in 1970. 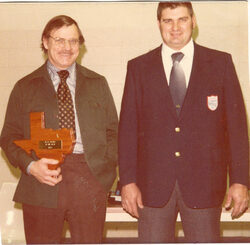 Oliver passed the certification for National Referee in 1980 at the National High School Championships in Odessa. He was selected to work as technical official at the 1990 Pan American Games in Indianapolis and at the 1996 Olympic Games in Atlanta, Georgia. Batch, as he is known around the club, has worked at the US Invitational (international) for approximately ten (10) years at the US Olympic Training Center in Colorado Springs and in Las Vegas. He placed in two National Championships and six Texas state tournaments. 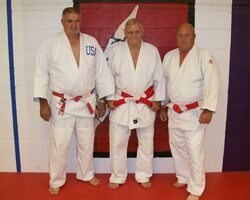 He has held a number of key positions with Texas Judo, Inc., including President for a number of terms, Vice President, Secretary, and Treasurer. Oliver volunteered his time with the Odessa Boys Club for well over 42 years with pride, excellence and commitment." 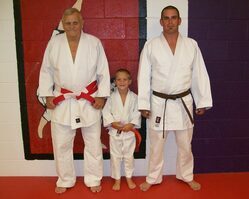 Oliver R. Batchelor was promoted to 6th Degree Black Belt "Rokudan" on September 23, 2008 then passed away seven months later on 21 April 2009. We miss him, and we won't forget him. 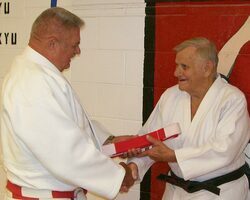 Dale Lehman presenting Oliver R. Batchelor his "Red & White"
belt for promotion to Rokudan.